Instagram is said to be internally testing a web version of Instagram Direct messaging that lets users to chat with others without the app. 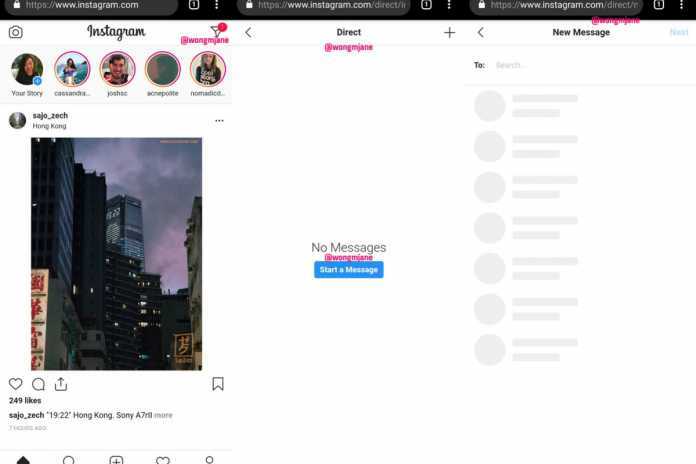 When this feature rolls out, the Instagram Direct message will be available on the desktop, Android, iOS and the mobile web browser. Instagram Web Version of Direct Messages would make it more usable and a full-fledged SMS alternative rather than just a tacked-on feature for discussing the photo and video app’s content. Messages are an important driver of engagement that frequently draws people back to an app. This also gives Facebook a chance to monetize, as it could get users browsing through more ads while they wait for replies. It could also pave the way for Facebook’s plans to the unification of the backend infrastructure for Messenger, WhatsApp, and Instagram Direct. Instagram Direct is not available to users yet, and it still being tested internally to identify any bugs or necessary product changes. In the current design state, Direct on the web is available from a Direct arrow icon in the top right of the screen. The feature looks like it will use an Instagram.com/direct/…. URL structure. if Instagram Direct gets popular, Facebook could pull it out of Instagram and give its own Direct destination website similar to www.messenger.com, which launched in 2015. Instagram began testing the standalone Direct app last year, but it’s yet to be launched officially. Instagram web Version experience is lagged behind its native apps. You still can’t post Stories from the desktop.